The Discourse Solved plugin allows users to accept solutions on topics in designated categories. You can enable filter dropdown in topic list pages using the site setting show filter by solved status (Requires Discourse 2.3.0.beta5 or above). As it stands our plugin system has no clean way of shipping badges and removing them when plugin is removed. While this is being solved you can add badges to your liking via the badge interface. This is an official plugin, we plan to ship it to all our customers. Thank you to Western Digital for funding the development of this plugin! What is this checkbox icon in the topic list? How do you enable a tick mark? Solved plugin: post menu button now hidden at far right, used to be on the left? Discourse for helpdesk use cases? What cool data explorer queries have you come up with? Discourse need a fork to be a Q&A software? Discourse Plug-ins : Where to start? What is SQL Badge Query for invited >25 People? How To Mark a Topic As Resolved? How can I turn discourse to Q&A based website? Discourse to Power Q & A Site? 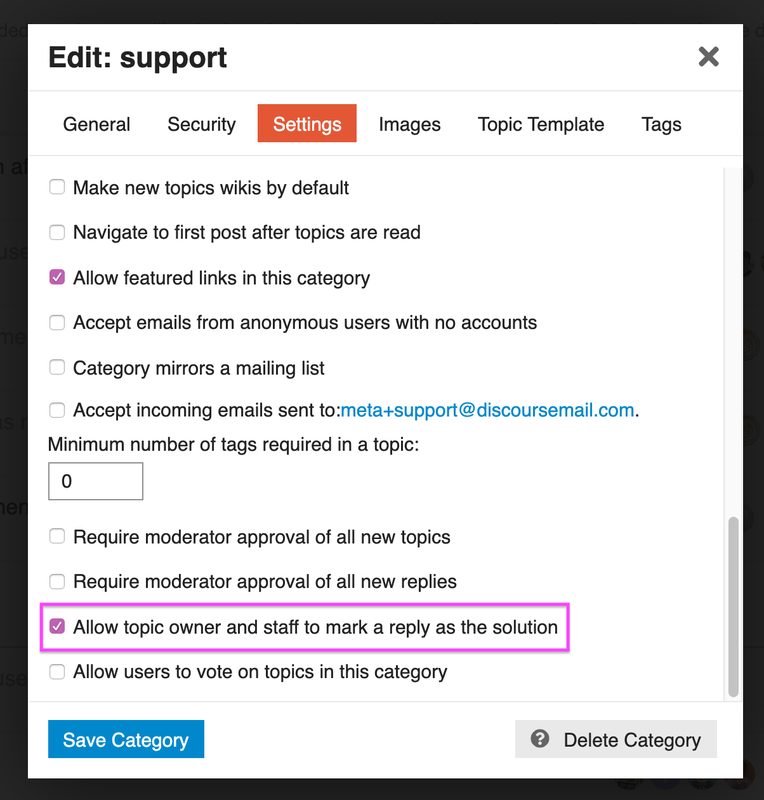 All discussion on the topic of Discourse solved should live in the #plugin:solved category.